I have a little person in my family who collects bottle tops. He thinks they are akin to gold coins. He was inspired by my mother, a collector and treasure hunter from waaayyyy back. She instilled this love of bottle tops in him when we were enjoying a coastal summer. We tapped into the best beer-bottle-top haunts, and it was like Christmas had come all over again for my little fellow. His eyes were like saucers. He was happy. The bottle tops sit on a circle of wire on a hook, high on the wall, waiting till he comes to play again. Another not fully grown person in my family collects stones. Nice smooth ones. Into the pocket they go! I still remember him at the beach totally overwhelmed by the bounty of smooth stones laid randomly before him. He stuffed one after another into his shorts, so that they were dragging down around his knees. He held onto his waistband and waddled back to the car with a look of pure delight on his face. One last little friend of mine collects the world’s tiniest shells. She hands them to me to guard and keep safe so that she can continue her beach raid of micro pipis, I try to protect them in my hand – but instead I produce shell grit for any happy budgie. I crush them with my big silly hands while accepting the newest addition. The other day I found a little round stone, that I automatically stopped and picked up. I rubbed it between my fingers, and for the hour I was holding it, it felt like the most treasured possession. I misplaced it for an hour and was quite frantic. It turned up later. I have stones from New York, Pebbles from San Francisco, the smoothest, roundest rocks from Kioloa. They are all special to me. The day after, whilst walking wicked puppies in the Autumn leaves, again I stopped, this time I happened across the most amazing sight. A first for me. I found a butterfly. All tucked up, ankles politely crossed, wings folded down protecting a still tiny body. I held it in my hand with my thumb across my fingers like a wee butterfly car seat, moving slowly home. I didn’t dare look incase the wind decided to take her away while my hand was open. 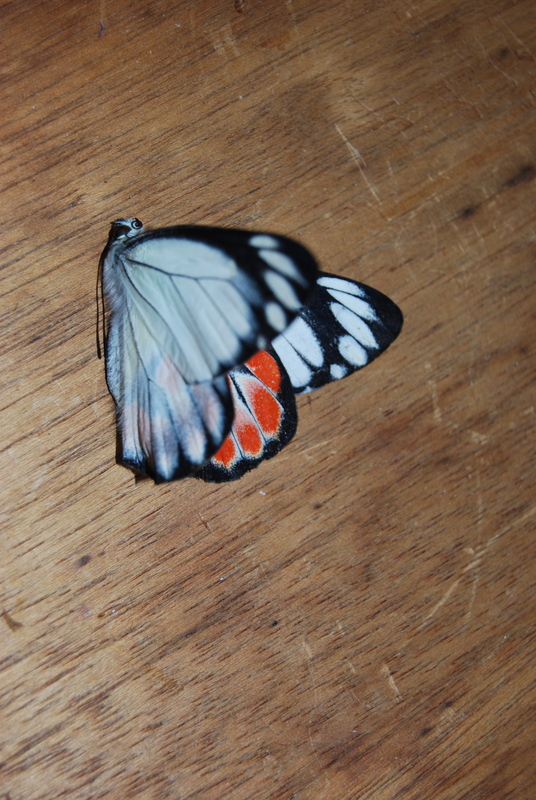 I arrived home and opened my hand to find the most extraordinary coloured butterfly. All mine. Such satisfaction! I have become a collector. My children are collectors, my mother is the mother of all collectors. She taught us all to notice the sky, and notice the ground. So, look at the sky, and take the time to look at the leaves on the ground. Treasure is everywhere. I still find shells in my pockets after trips to the beach and I am 41 and I still think they are beautiful and admire them every time I see them anew…Good one Em! 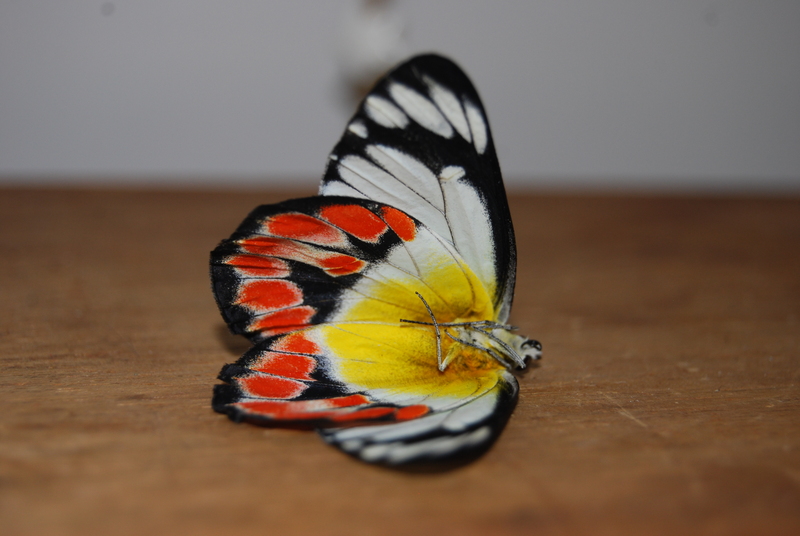 I collect butterflies and bugs also like this, Finding treasure in the simple. I love how your site is organized. It seems you have a beautiful humble heart. Thanks for the blog follow and gladly will follow back. Are you the sweetest thing ever? I think so! What a lovely thing to say, boosting my spirits as I sit here in hospital with a son with an arm fracture. It just goes to show how simple words can change a person’s day. Thank you so much for taking the time to let me know. Thanks and have a blessed week with the cool stuff you love.